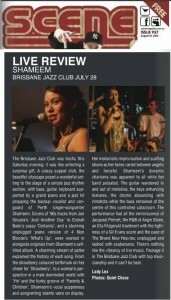 The Brisbane Jazz Club was hectic this Saturday evening; it was like unfurling a surprise gift. 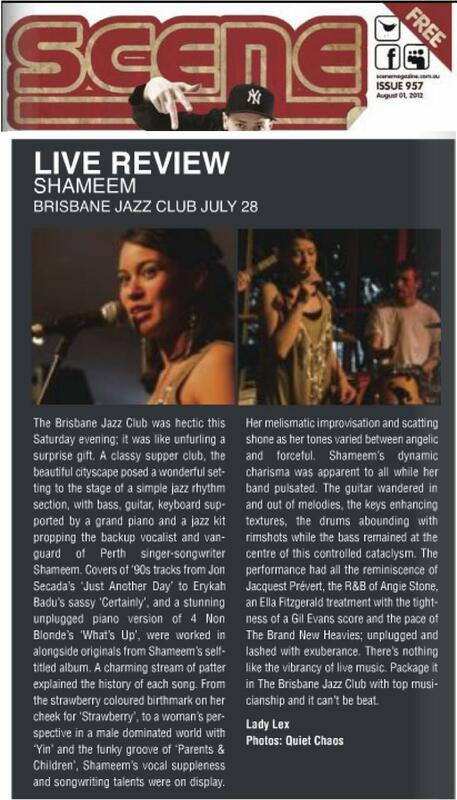 A classy supper club, the beautiful cityscape posed a wonderful setting to the stage of a simple jazz rhythm rhythm section with bass, guitar, keyboard supported by a grand piano and a jazz kit propping the backup vocalist and vanguard of Perth singer-songwriter Shameem. Covers of ’90s tracks from Jon Secada’s ‘Just Another Day’ to Erykah Badu’s sassy ‘Certainly’, and a stunning unplugged piano version of 4 Non Blonde’s ‘What’s Up’, were worked in alongside originals from Shameem’s self-titled album. A charming stream of patter explained the history of each song. From the strawberry coloured birthmark on her cheek for ‘Strawberry’, to a woman’s perspective in a male dominated world with ‘Yin’ and the funky groove of ‘Parents & Children’, Shameem’s vocal suppleness and song-writing talents were on display. Her melismatic improvisation and scatting shone as her tones varied between angelic and forceful. Shameem’s dynamic charisma was apparent to all while her band pulsated. The guitar wandered in and out of melodies, the keys enhancing textures, the drums abounding with rimshots while the bass remained at the centre of this controlled cataclysm. The performance had all the reminiscence of Jacques Prevert, the R&B of Angie Stone, an Ella Fitzgerald treatment with the tightness of a Gil Evans score and the pace of The Brand New Heavies; unplugged and lashed with exuberance. There’s nothing like the vibrancy of live music. Package it in the Brisbane Jazz Club with top musicianship and it can’t be beat.